Ensuring kids read for 20 minutes each night has become an ingrained habit for most parents. But there are nights when kids just have no desire to crack open a book. Maybe they’re sick. Or tired. Maybe they’re simply sick and tired of reading solo. No child is too old for a parent to read aloud to them. And parents aren’t sacrificing reading benefits by narrating a story instead of forcing kids to read silently. Reading in every form is beneficial…even if it’s auditory-based reading. According to a 2015 study conducted by Dominic Massaro, of the Department of Psychology at the University of California in Santa Cruz, having parents read aloud actually helps young children develop vocabulary better than simple conversations. The reason? Books offer a more robust vocabulary than our everyday discourse. Reading aloud benefits kids even during infancy. According to Readaloud.org, parents should read out loud 15 minutes each day beginning at birth; infants especially love when parents engage them with exaggerated faces. 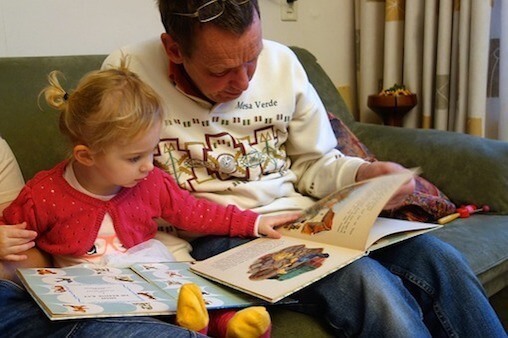 As babies blossom into toddlers and then into preschoolers, reading aloud holds other benefits. With more complex cognitive abilities, children begin to explore the thoughts and feelings of characters and predict outcomes. When reading aloud to infants and children, make the experience more impactful…and keep kids engaged at every age. Readaloud.org tells parents not to worry if babies chew on books; just make sure to buy heavy board books for teething infants to explore. Whether they chew on pages or flip through the book, encourage babies to engage with books. Parents also can select books with touch and feel textures that provide explorative ways for baby to interact with the pages as parents read aloud. Keep voices fun, upbeat and expressive…babies love silliness and funny faces! Colorful board books by Eric Carle are ideal for babies…and fun for parents, too! This age group begins to have a mind of their own…and that’s a good thing. Allow little ones to explore their autonomy by selecting their own books. Keep favorite stories at their height so they have access to books. Talk to kids while reading the story, and name colors or animals together within the books. Great books to explore with toddlers include Dr. Seuss’ “Hop on Pop,” “If I Ran the Zoo,” “Green Eggs and Ham” and the classic favorite “Goodnight Moon.” Preschoolers will love the rhyming singsong patterns. Around second grade, kids will begin reading alone (although some start sooner…or later). Your child may have even graduated to chapter books. However, reading aloud is still beneficial, and gives kids a fun break from independent studies and reading. Focus on comprehension with older kids. Make sure kids understand what’s going on throughout the book by asking questions as the plot moves along. Inquire how characters might be feeling throughout the story, and see if kids can predict what will happen next. Early grade school kids will love books by Judy Blume (like “Tales of a Fourth Grade Nothing”) and the Ramona Quimby books by Beverly Cleary. Older grade schoolers will probably be interested in exploring the “Harry Potter” series. Reading aloud is beneficial throughout childhood. In infancy, reading aloud helps introduce babies to sounds and gets them ready for language. Toddlers and preschoolers also are introduced to a more expansive vocabulary, and having parents read aloud helps build on phonics skills. For older kids, reading aloud provides an opportunity to listen to the story and then make predictions about the plot. Most importantly, reading aloud creates an opportunity to bond with children and spend quiet quality time together. Naomi Shaw lives in Southern California with her husband and three kids. She is a free-lance journalist and stay at home mom that enjoys writing on fashion, beauty, and health. You can connect with her via twitter @naomijshaw or look at some of her writings in her personal blog naomijshaw.weebly.com.